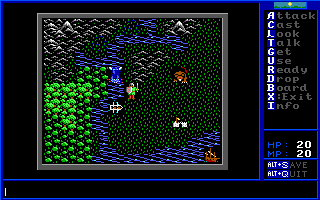 The “Ultima V” class of CRPG editors are likely the most basic class of CRPG editors out there. (That’s not an official name, but I think it sums up pretty well the intentions and limitations of this kind of toolkit.) And if you intend to create a game similar to Ultima V, give or take minor features, I would suggest using the Adventure Creation Kit (or “ACK” for short). 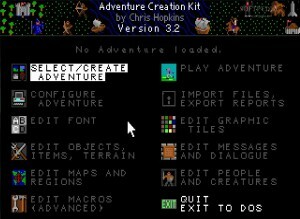 It is fun and easy to use and you will quickly have something playable, so if you’re satisfied with basic CRPG functionalities, take a look. As soon as you’re looking for even slightly more editing power, you should probably rather head to some of the other systems featured here – while ACK does offer scripting functionality, if you spend that effort, why not go to the more complex systems in the first place? I actually had a lot of fun creating a sizable campaign with ACK, but that was over 20 years ago, publishing (and bug support) over the internet wasn’t invented yet and I had no idea that I would ever regret shredding those 3.5″ disks. Oh well. That should not stop you from having fun, however.